Sixteen lucky passengers on Air Niugini flights on Friday (25th September) were upgraded to business class seats as part of the airline’s promotion in recognition of the country’s 40th anniversary. These passengers were selected from the airline’s booking system as the 40th passengers to have booked flights and were surprised when ANG staff at the check in counter handed each of them a boarding pass with an upgrade on the seat. Among them was Merilyn Hipson from Karanda village in Erave, Southern Highlands Province who was traveling back to her village via Mount Hagen. This was Merilyn’s second time on an airplane, her first flight was in 2012 when she arrived in Port Moresby. Merilyn and her 8 month old son, Gabriel were traveling with a funeral party on the Hagen flight when an Air Niugini staff surprised her with a business class boarding pass, a pass for access to Executive Club lounge and a letter to have K100 worth of excess baggage waivered on her next travel with ANG. Other winners on the domestic sector, Robin Tonga a crane operator with MMJV and Joan Luni who graduated recently from UPNG were grateful for the opportunity to travel for the first time on business class. Dorothy Pomat on the other hand was traveling to Cairns, Australia for the weekend and had this to say. “ I was shocked when handed my business class boarding pass, another pass to the boarding lounge and K100 worth of excess waiver which I will use on my return from Cairns. What a great start to my weekend. ” Pomat said. Similar promotions were carried out in other domestic ports as well as Sydney, Brisbane, Cairns and Manila for passengers traveling to and out from these destinations back to Port Moresby. 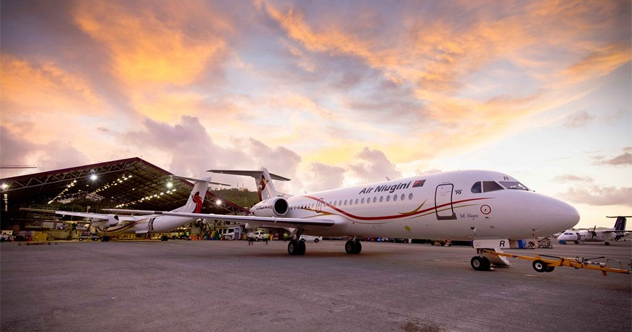 Air Niugini has been carrying out this promotion every Friday of September in recognition of the country’s 40th Independence anniversary.